The Single Burner Gas Stove, SU 1B-108 S/STAR provided by us is highly appreciated for high-end features such as low Gas consumption and easy installation. These are widely used in high-end homes, outdoor, picnic, vacation, family outing, etc. These stainless steel stoves are designed to provide easy operation, maintenance, and cleaning. 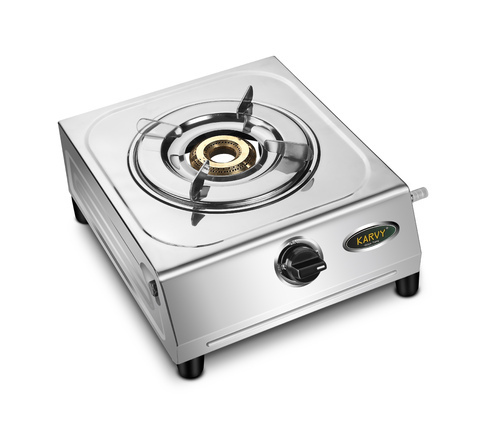 We are ISO 9001-2008 certified and with an experience of 10 years we have gained immense domain expertise in offering Gas Stoves, Stainless Steel Gas Stoves, LPG STOVES, Portable Gas Stoves, Single Burner Gas Stove, Double Burner Gas Stove, Three Burner Gas Stove, 5 Burner Gas Stoves, Cook Tops, Glass Top Gas Stoves & Induction Cookers with Automatic / Manual Ignition Systems, Stainless Steel/Glass Top Bodies and fitted with single / double /three / four & five brass burner option. All these products are manufactured under strict quality control parameter laid down by Bureau of Indian Standard. We also undertake complete after sales services of our range so as to attain highest level of client satisfaction. These are available in steel, brass, MS, aluminum, cast iron, MS pipe finish that provides efficient long working life and optimum performance. We make sure to meet the clients’ specific requirements by providing customization in terms of body finish, design and burner options as specified by our esteemed clients.